I love a wedding, but don’t we all? Yet the royal wedding of Queen Elizabeth’s grand daughter, is something very special, full of pageantry, the splendour of Windsor castle, along with the royals all dressed up. It is always fascinating to see the first glimpse of the dress, the flowers and the outfits of all the wedding guests. I was pleased to see that there were myrtle flowers in Princess Eugenie’s bouquet, which is a royal tradition. It all reminds me of the wedding of the Duke and Duchess of Cambridge back in 2011, when after studying the bridal bouquet I digitised the Bridal Grace collection. Kate Middleton’s bouquet featured lily of the valley, hyacinths, sweet williams, myrtles and ivy leaves, all symbolic. 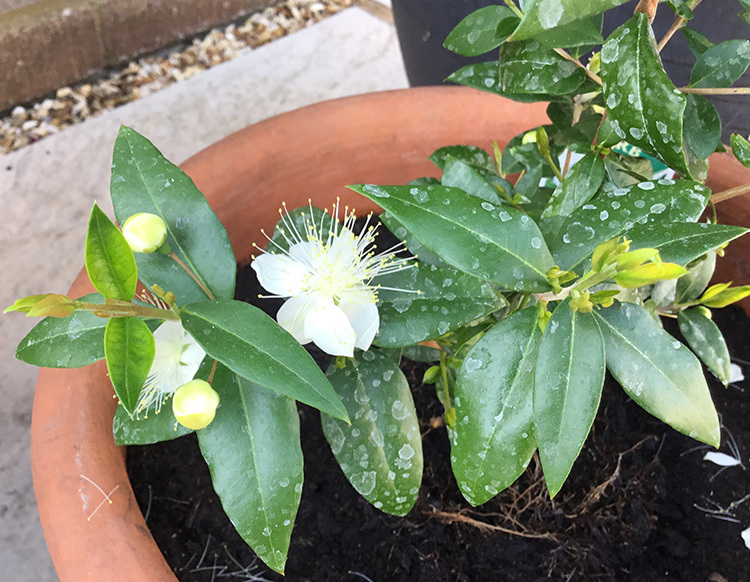 Earlier this year I noticed that myrtle plants were for sale in a little nursery that I visited, so I had to have one, and this is my plant which flowered for the second time back in July. You can see all the new growth which happened when the drought came to an end here in England. I will treasure this plant as its flowers are so precious. 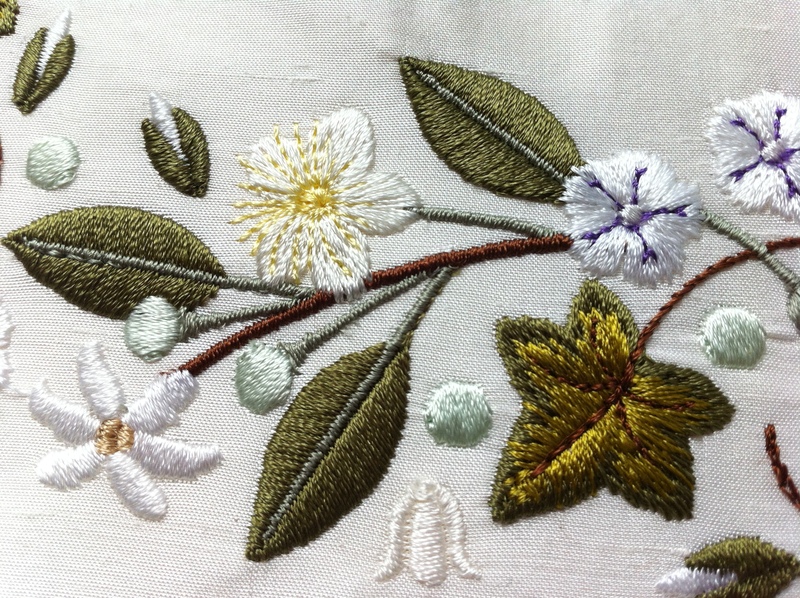 The buds which are featured in the embroidery designs really are tiny globes of cream! 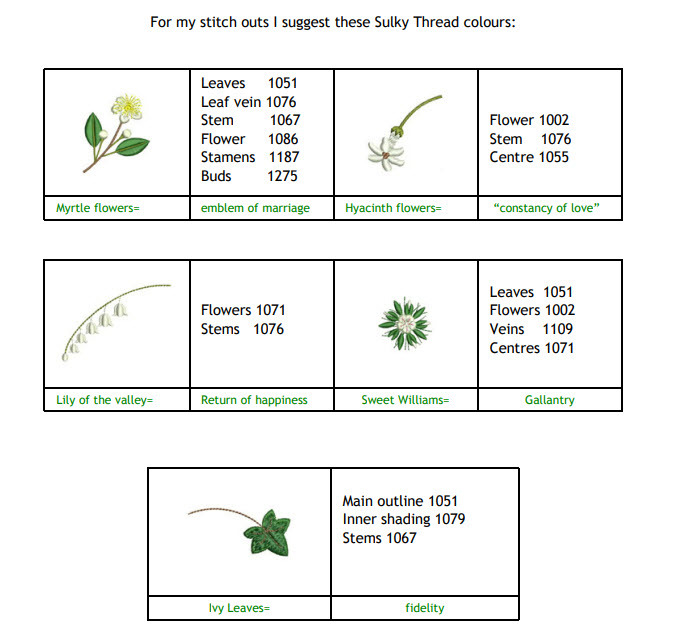 Ok, I made them pale green, but I don’t think I had so many colours in my palette of embroidery threads back then, and it also proves that digitising can be more accurate when you are familiar with the flowers you are transforming into embroidery, growing them in your own garden which I love to do. I am still immensely proud of the collection of designs and you can see it here, in all its glory in the original colours. Today Princess Eugenie had very similar flowers in her delicate bouquet, all symbolic, white roses, stephanotis, myrtles, lily of valley and thistles. 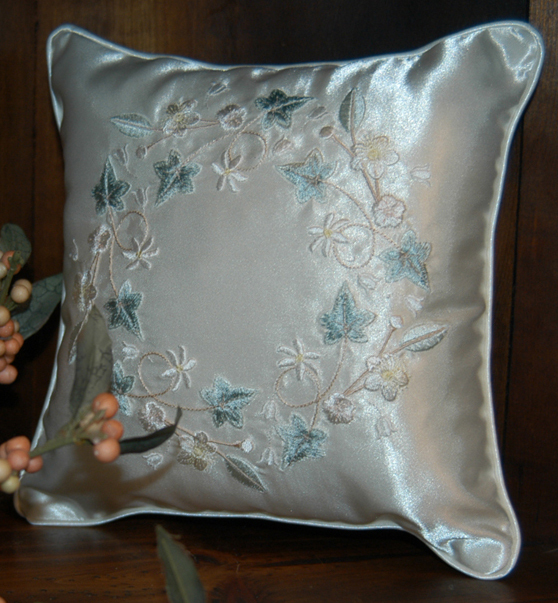 The flowers of stephanotis, with their delicious fragrance, are very similar to the hyacinths symbolizing a crown. The Greville tiara with emeralds, borrowed from the Queen, matched the glorious leaves of the flowers. In fact some of the floral displays represented trees and there were trees outside the chapel. The delicate blue thistles were a wonderful addition to the bouquet symbolizing strength, bravery and determination, perfect for a bride prepared to show the large scars on her back from surgery at the age of 12. I loved her dress and when I was able to find close ups of the fabric, it was evident that it was produced especially for the dress, made of a silk, viscose and cotton mix with motifs which included thistles representing Scotland, shamrocks for Ireland and roses for England, along with ivy. As there are four days left in the Birthday event you can still purchase the 5 sets of Bridal Grace designs for $7.50 each, but this sale finishes on Monday 15th October, 2018. 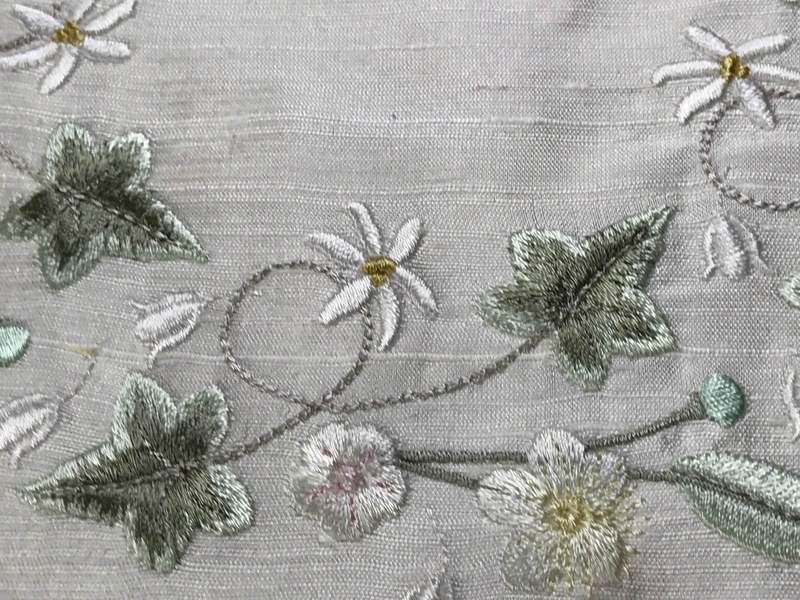 This entry was posted in Discussing machine embroidery and tagged Bridal embroidery, development of embroidery, machine embroidery. Bookmark the permalink. Lovely designs. I love weddings too. I just love the way you get ahead and digitize all these beautiful ideas from all the Royal weddings – makes it so special for those of use who do not live in the UK but are so supportive – thank you for your wonderful ideas Hazel. Please tell me how to purchase one of the Bridal Grace sets for $7.50. Is there a coupon code that needs to be entered? Log into your account and place the items you require in your cart. Then go to the view cart page and add code “offer” to get 75% off.